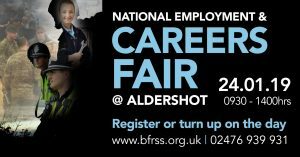 BMC are delighted to once again be attending the BFRS National Employment & Careers Fair at Aldershot. BFRS (British Forces Resettlement Services) events provide the Armed Forces Community (AFC) with a great opportunity to meet and network with training providers, like BMC, as well as potential employers. It’s a great opportunity to find out about the various industry sectors available and to find out about the different qualifications they may need from reputable, ELC approved training providers who can help them gain new qualifications to facilitate a move to a new career. In your final 2 years of service and looking for your next career? Looking to change jobs? Seeking CV advice? then this is a great opportunity to talk to professionals who can help. The event is open the Armed Forces Community, which includes Service Leavers, Reserve Forces, veterans, partners & families as well as civilians working for the MoD.